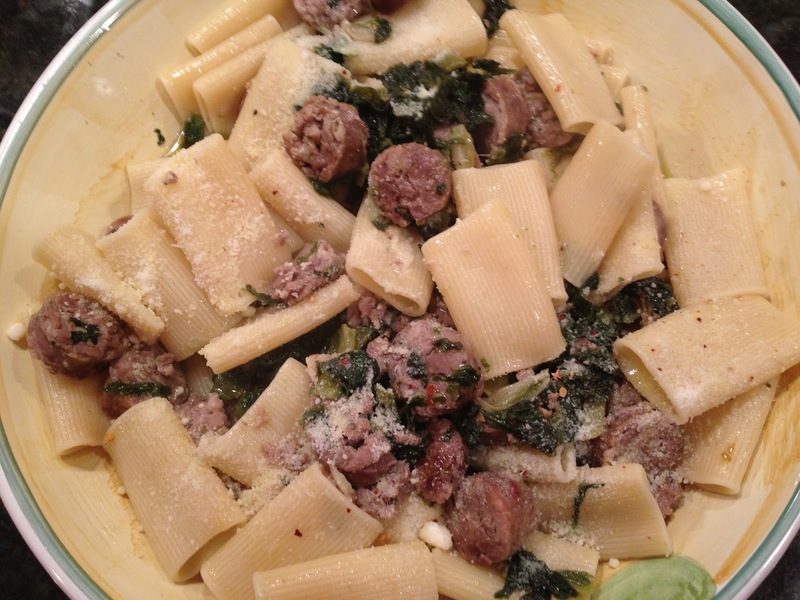 Pasta with broccoli rabe and sausage. Who doesn’t love that? It’s become as ubiquitous as fried calamari these days but it’s still so delicious. But what to do when the local market has no broccoli rabe? As many chefs have repeatedly told me: “You buy what looks the freshest, the best.” And so I did…. The first thing you need to do is roast the garlic. It doesn’t take long, but I usually do it ahead of time on the weekends and then use it the following week. Slice the cloves into 3 or 4 pieces depending on the size and toast them in some olive oil until they begin picking up some brown color. If you do this ahead, just put them in a small dish and cover them in olive oil. They’ll last for weeks like that on the kitchen counter and the longer they sit, the better the oil will taste. 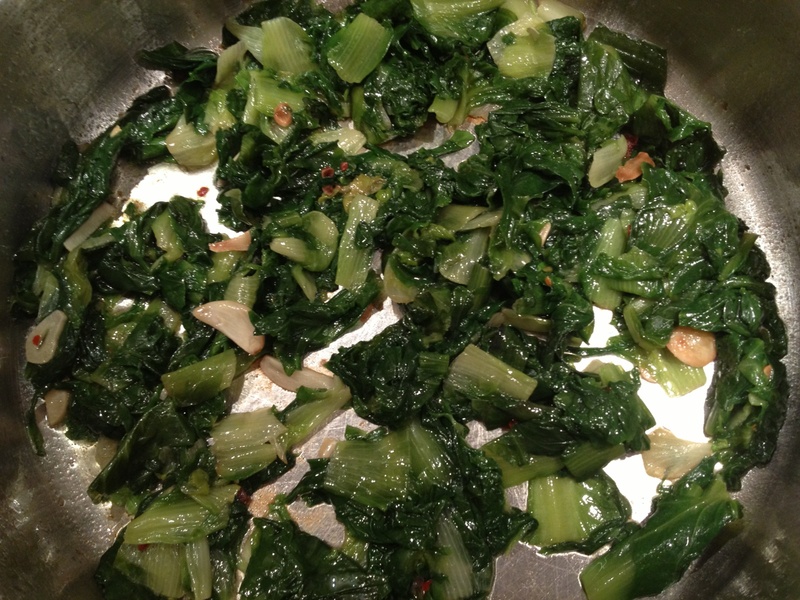 Clean and chop the escarole. Shake to dry, but while it’s still damp, begin to braise it in olive oil with the garlic. Add salt and pepper to taste. After about 5-7 minutes it will look like the picture below and still be somewhat firm to the bite. That’s how you want it. 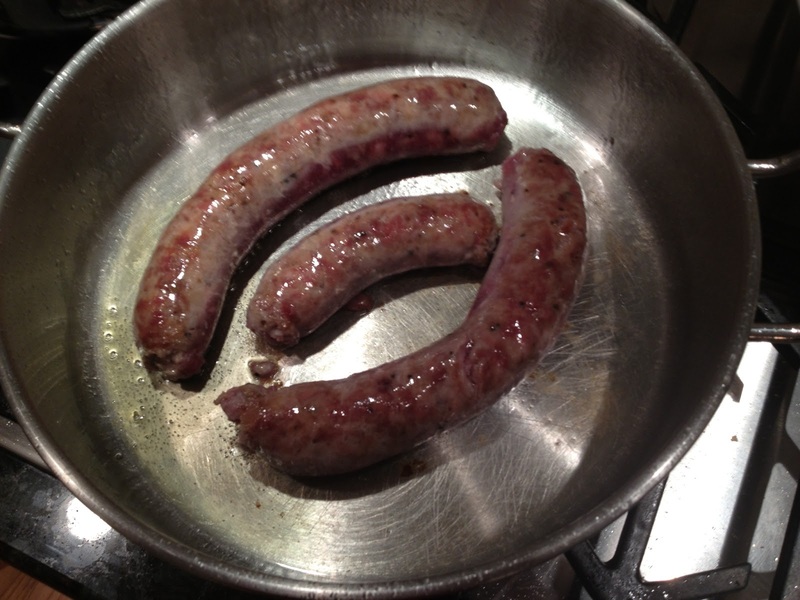 In a separate pan, brown the sausage well but do not cook through. Remove to a cutting board, slice cross-wise and then add to the escarole to finish cooking. The sausage will be cooked through by the time the pasta is al dente. The key is to make sure the flame is high enough so that you get good color on the sausage quickly without cooking it the entire way through. 3-5 minutes on moderately high heat will work. I chose an artisanal pasta to pair with this “condimento” – something hearty because it was all of 9 degrees outside! 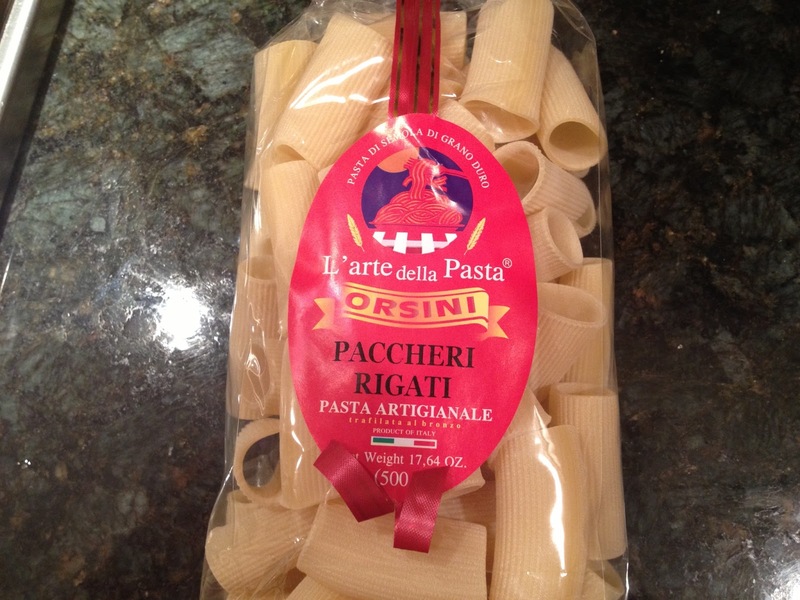 I settled on Paccheri Rigati. Essentially, these are oversized Rigatoni that have ridges which hold the escarole and the garlic oil well. Finally, once the pasta is al dente, I drained and removed it to the pan with the escarole, garlic and sausage. I hit it with a bit more olive oil and also about 3/4 cup of the pasta cooking water, so make sure you reserve some of that before you drain the pasta. Sprinkle with Pecorino, pass the pepperoncino at the table and serve immediately. With this slightly spicy, comforting meal, I opened a wine I recently acquired which was new to me. I’m letting the cat out of the bag in big way here. The 2009 Montepeloso Eneo is as stunning as it is unique. Hailing from the Suvereto area of Tuscany, near Bolgheri, Montepeloso’s next door neighbor is the famous Tua Rita, and they are benefiting from the same excellent terroir that has made Tua Rita world class. Montepeloso was purchased in 1998 by Fabio Chiarelotto who saw the potential for untold greatness at this estate. Chiarelotto has been compared to none other than Montalcino’s Soldera – in that he possesses an obsessive commitment to quality and a lack of concern for what others think of him or his wines. He’s achieving amazing results. The 2009 Eneo is dark garnet to deep ruby in the glass. It’s a unique blend of 45% Sangiovese, 35% Montepulciano, 10% Alicante Bouschet and 10% other unspecified varietals. The nose of the wine is remarkable. Deep black cherry is accented with new leather, savory herbs, and sweet tobacco. The flavors follow the nose with the full bodied luxurious fruit center stage against the back drop of those juicy, savory wild herbs. The spicy smokiness of the Montepulciano comes through on the finish but overall, this wine behaves as a classic, monumental Sangiovese Super Tuscan. It’s a stunning effort and worth seeking out. It’s put together so well, with silky tannins, that it’s drinking great now, but will easily cellar 7-10 years. A rising star in Tuscany. 95 points, about $32. Also tasted recently, was the successor vintage to the great 2007 Tolaini Al Passo. This wine features one of my favorite blends – Sangiovese and Merlot. 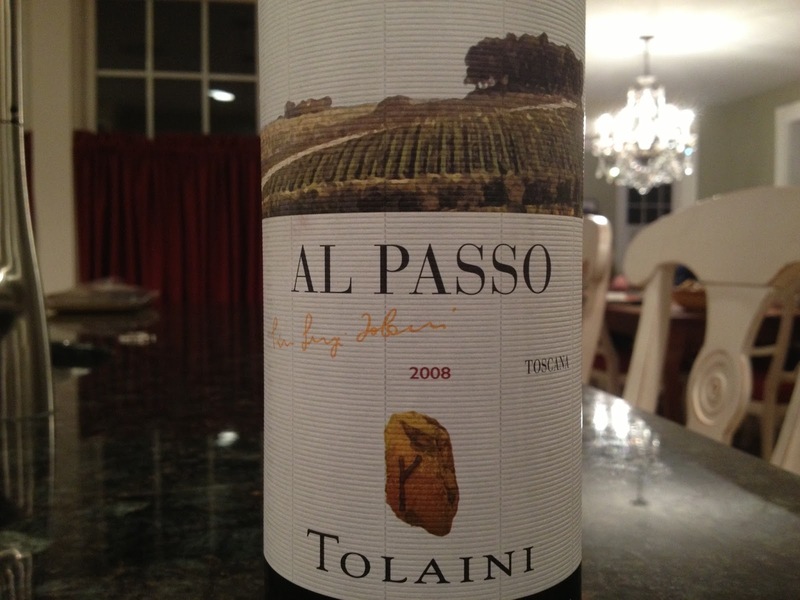 The 2008 Tolaini Al Passo may just be better than it’s 2007 sibling. As I noted in my Tolaini Interview, the 2007 had a slight gamy edge to it – a garrique that some may have found difficult to enjoy. The 2008 doesn’t display that streak. In the glass, the wine is a lovely deep violet and boasts aromas of flowers, mushrooms, and berries. I was struck by the increased floral component to the wine – it reminded me of the very floral 2008 Piaggia Carmignano – and I’m wondering if there’s a vintage characteristic at work here. Still, the wine seems fresher, livelier, juicier on the palate. The berry flavors are long and persistent and tinged with licorice and espresso notes. A lovely wine and very good for the vintage. Once released, average retail should be about $18-$25. Disclosure: This bottle was a distributor provided sample. 93 points.